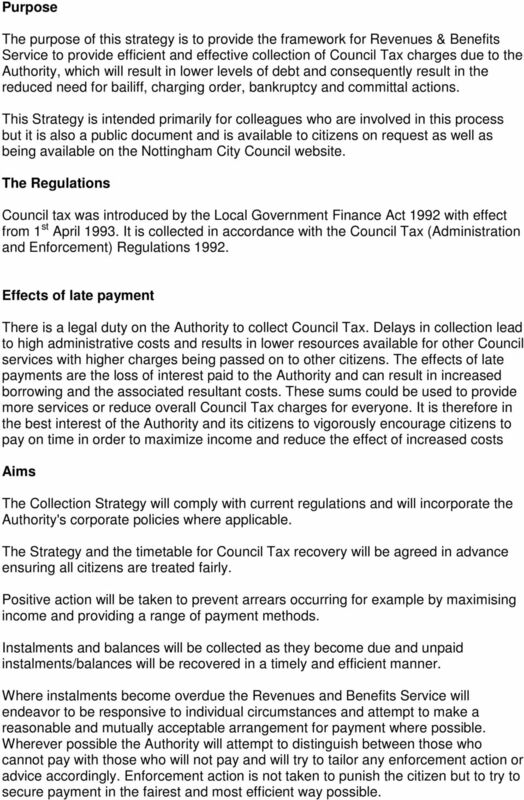 Download "Nottingham City Council. 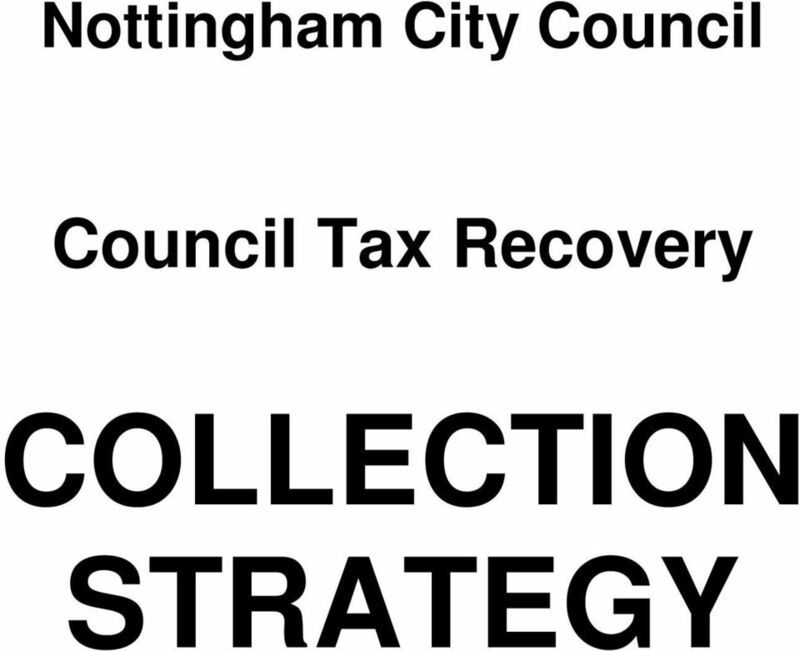 Council Tax Recovery COLLECTION STRATEGY"
2 Purpose The purpose of this strategy is to provide the framework for Revenues & Benefits Service to provide efficient and effective collection of Council Tax charges due to the Authority, which will result in lower levels of debt and consequently result in the reduced need for bailiff, charging order, bankruptcy and committal actions. This Strategy is intended primarily for colleagues who are involved in this process but it is also a public document and is available to citizens on request as well as being available on the Nottingham City Council website. The Regulations Council tax was introduced by the Local Government Finance Act 1992 with effect from 1 st April It is collected in accordance with the Council Tax (Administration and Enforcement) Regulations Effects of late payment There is a legal duty on the Authority to collect Council Tax. Delays in collection lead to high administrative costs and results in lower resources available for other Council services with higher charges being passed on to other citizens. The effects of late payments are the loss of interest paid to the Authority and can result in increased borrowing and the associated resultant costs. These sums could be used to provide more services or reduce overall Council Tax charges for everyone. It is therefore in the best interest of the Authority and its citizens to vigorously encourage citizens to pay on time in order to maximize income and reduce the effect of increased costs Aims The Collection Strategy will comply with current regulations and will incorporate the Authority's corporate policies where applicable. The Strategy and the timetable for Council Tax recovery will be agreed in advance ensuring all citizens are treated fairly. Positive action will be taken to prevent arrears occurring for example by maximising income and providing a range of payment methods. Instalments and balances will be collected as they become due and unpaid instalments/balances will be recovered in a timely and efficient manner. Where instalments become overdue the Revenues and Benefits Service will endeavor to be responsive to individual circumstances and attempt to make a reasonable and mutually acceptable arrangement for payment where possible. Wherever possible the Authority will attempt to distinguish between those who cannot pay with those who will not pay and will try to tailor any enforcement action or advice accordingly. Enforcement action is not taken to punish the citizen but to try to secure payment in the fairest and most efficient way possible. 3 Responses will be made to complaints within 12 working days, and, depending on the nature of the complaint, recovery action may be suspended pending further investigation. Key indicators The key indicators used to measure collection performance are: The percentage of Council tax collected within the year The level of collection of arrears carried forward from previous years Good Practice Good collection practice is effective and efficient collection of monies, using the methods determined by legislation and regulation. Customer Care The Authority welcomes suggestions for improvements to the service. We will provide clear and prompt information about bills and liabilities. Bills will show what they relate to, the amount due, how to make a payment and will provide a contact point for all enquiries. The Authority will inform citizens of the availability of benefits, discounts, reliefs and exemptions and will try to ensure that maximum take-up occurs and that net bills/liabilities are issued. Colleagues who deal with citizens will be trained on debt matters and on the range of benefits and discounts available to enable them to provide assistance to ensure maximum take-up. They will also be provided with regular updates of any changes. 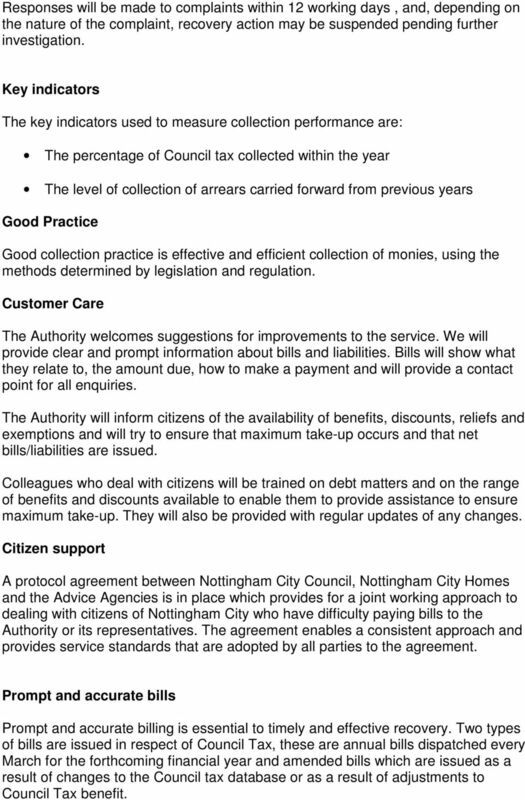 Citizen support A protocol agreement between Nottingham City Council, Nottingham City Homes and the Advice Agencies is in place which provides for a joint working approach to dealing with citizens of Nottingham City who have difficulty paying bills to the Authority or its representatives. The agreement enables a consistent approach and provides service standards that are adopted by all parties to the agreement. Prompt and accurate bills Prompt and accurate billing is essential to timely and effective recovery. Two types of bills are issued in respect of Council Tax, these are annual bills dispatched every March for the forthcoming financial year and amended bills which are issued as a result of changes to the Council tax database or as a result of adjustments to Council Tax benefit. 4 Annual bills are produced as soon as possible after the Council Tax charges have been set. Other bills and invoices are produced and dispatched on a daily basis. The accuracy of information is crucial. Part of this is having good administration. Information will be updated as soon as possible after a change has been reported. Delays in processing can delay collection, which can affect how much is collected. Any delays in processing benefit claims and other relief, discount and exemption applications will also impact on collection performance. Frequency of payment Citizens have the right to pay by monthly instalments. To ensure collection by the earliest possible date, the minimum number of instalments, according to the Regulations, will be given as follows: If the Demand (bill) is issued on or before 31st May of the relevant year- then 10 instalments must be given. If the Demand is issued on or after 1st June in the relevant year - the instalments given will be one less than the number of whole months remaining after the issue of the Demand. Payment methods Direct debit is recognised to be more cost effective and easier to process than other collection methods, and so is actively promoted as the Authority s preferred payment method and is encouraged by all Revenues and Benefits service staff at every opportunity. Weekly instalments are offered as well as monthly instalments and citizens can opt for 12 instalments from April through to March as an incentive to pay by this method. A major barrier to increased direct debit take-up is that some citizens either do not have a bank account or their income is not regular enough to guarantee direct debit payments. This affects deprived areas such as Nottingham City Council far more than others, which means that an Authority s actual direct debit take-up rate is not necessarily a sign of its commitment to improving take-up. In recent years the government has pushed for everyone to have a bank account, and they introduced a Universal Bank Account. However, this account does not allow the holder to set up direct debits. Many citizens in deprived areas choose to pay in cash. It is therefore beneficial to have several payment options available in order to give as much choice as possible. Other payment options currently include on-line or by using our 24-hour payment line with a debit/credit card; by debit/credit card, cheque or cash at a Council payment office or Housing Office; by cheque via the post (payers are discouraged from sending cash via the post); by standing order, by Pay Point or at a Post Office. Some of these methods are quite costly to administer and may be subject to review. 6 ensuring that payment reaches the account by the agreed date remains with the citizen. Reminders Where a balance or instalment is not received by the due date a reminder notice will be issued. Due to the number of accounts administered by the Revenues and Benefits Service, reminder notices will not be checked individually before they are issued. However, wherever possible, checks will be made to ensure that reminders are not sent out in cases where we have received notification of the recent death of the citizen in order to prevent any unnecessary distress to any relatives. For unpaid Council Tax instalments, parameters are set in advance and reminder notices are issued on this basis. The parameters typically consist of the number of days in arrears and a monetary minimum value. Generally reminders are issued between 14 days and 20 days after the balance or instalment became due but this can be subject to change and can be as early as 7 days. A maximum of 4 reminder notices will be issued in any one financial year. A subsequent reminder will only be issued if the citizen complies with the terms of payment contained in the previous reminder and subsequently fails to pay a further instalment by the due date. 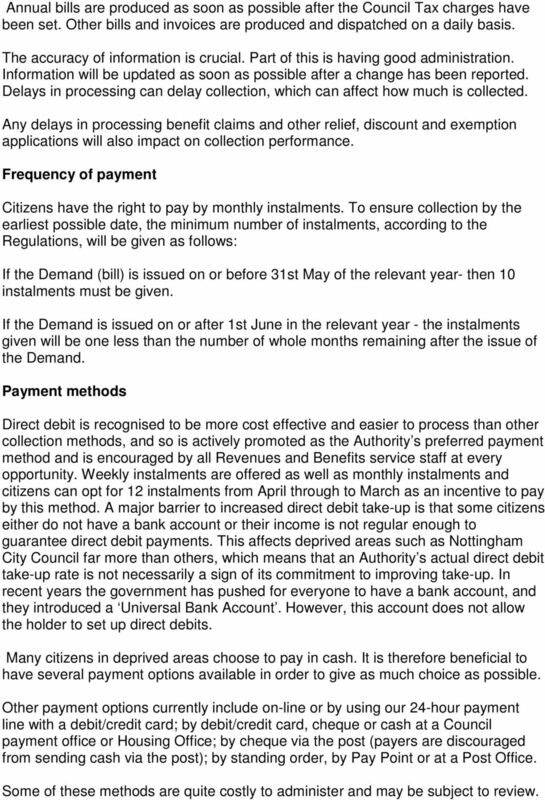 All reminder notices are issued with details of the available payment methods and details of the Direct Debit scheme to encourage take up of this more efficient method of collection. Reminder notices are issued by second-class post as soon as possible after printing. Final Notices If the unpaid amount refers to an account balance or where the maximum number of reminder notices have been issued, a final notice will be issued. 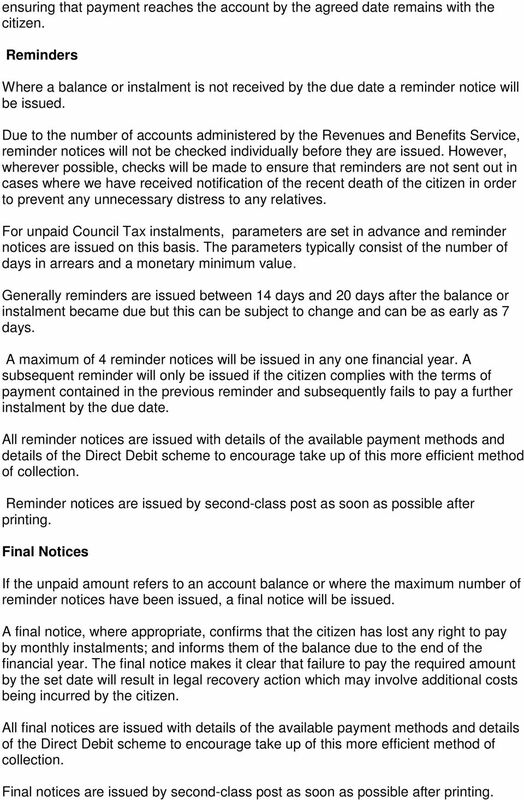 A final notice, where appropriate, confirms that the citizen has lost any right to pay by monthly instalments; and informs them of the balance due to the end of the financial year. The final notice makes it clear that failure to pay the required amount by the set date will result in legal recovery action which may involve additional costs being incurred by the citizen. All final notices are issued with details of the available payment methods and details of the Direct Debit scheme to encourage take up of this more efficient method of collection. Final notices are issued by second-class post as soon as possible after printing. 7 Summons A summons will be issued if the citizen has not made payment in accordance with a reminder and/or final notice previously issued. It is issued as a result of the Authority applying to the Magistrate s Court for a Liability Order against the citizen. The Authority will make a complaint to the Legal Advisor Authorised by Rule 3 (1) Justices Clerks Rules, requesting the issue of a summons. Where an arrangement to pay has been agreed to clear a Council Tax account, a summons will still be issued and a Liability Order sought to protect the Authorities interest. No further recovery action will then be taken providing payments are made as agreed. A summons will always be issued with a clear 14 days between issue and the court hearing date. The summons will state the amount due and the time and place of the Court hearing. The normal service of a summons will be by second class post and in accordance with relevant legislation and regulations. 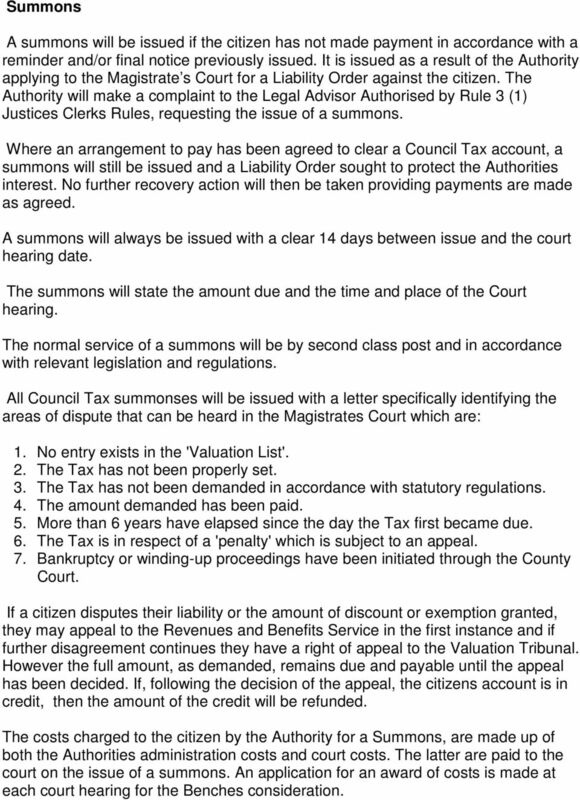 All Council Tax summonses will be issued with a letter specifically identifying the areas of dispute that can be heard in the Magistrates Court which are: 1. No entry exists in the 'Valuation List'. 2. The Tax has not been properly set. 3. The Tax has not been demanded in accordance with statutory regulations. 4. The amount demanded has been paid. 5. More than 6 years have elapsed since the day the Tax first became due. 6. The Tax is in respect of a 'penalty' which is subject to an appeal. 7. Bankruptcy or winding-up proceedings have been initiated through the County Court. If a citizen disputes their liability or the amount of discount or exemption granted, they may appeal to the Revenues and Benefits Service in the first instance and if further disagreement continues they have a right of appeal to the Valuation Tribunal. However the full amount, as demanded, remains due and payable until the appeal has been decided. If, following the decision of the appeal, the citizens account is in credit, then the amount of the credit will be refunded. The costs charged to the citizen by the Authority for a Summons, are made up of both the Authorities administration costs and court costs. The latter are paid to the court on the issue of a summons. An application for an award of costs is made at each court hearing for the Benches consideration. 10 and either committal, charging order, referral to a debt collection agency or bankruptcy proceedings will be considered. The Bailiff firms whose services are used by the Authority are required to comply with legislation and with the National Standards for Enforcement Agents as well as the Authority s own Code of Conduct Guidelines. The Authority takes any complaints about bailiff actions very seriously and will investigate all such complaints. 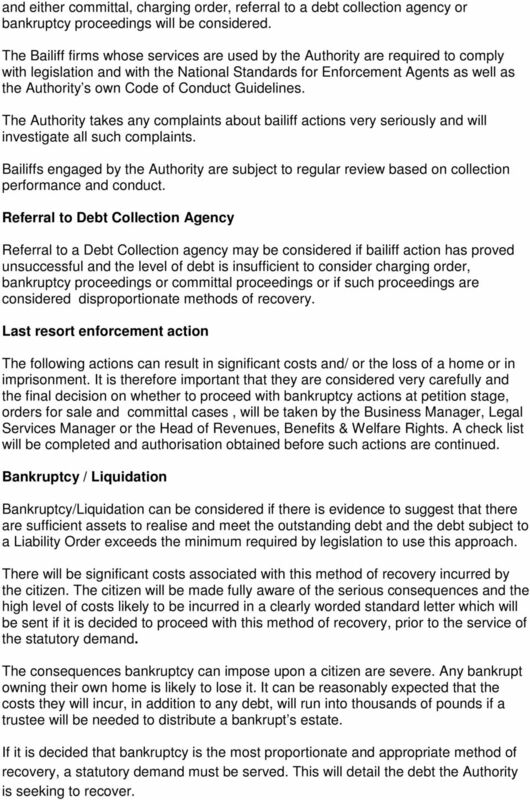 Bailiffs engaged by the Authority are subject to regular review based on collection performance and conduct. Referral to Debt Collection Agency Referral to a Debt Collection agency may be considered if bailiff action has proved unsuccessful and the level of debt is insufficient to consider charging order, bankruptcy proceedings or committal proceedings or if such proceedings are considered disproportionate methods of recovery. Last resort enforcement action The following actions can result in significant costs and/ or the loss of a home or in imprisonment. It is therefore important that they are considered very carefully and the final decision on whether to proceed with bankruptcy actions at petition stage, orders for sale and committal cases, will be taken by the Business Manager, Legal Services Manager or the Head of Revenues, Benefits & Welfare Rights. A check list will be completed and authorisation obtained before such actions are continued. Bankruptcy / Liquidation Bankruptcy/Liquidation can be considered if there is evidence to suggest that there are sufficient assets to realise and meet the outstanding debt and the debt subject to a Liability Order exceeds the minimum required by legislation to use this approach. 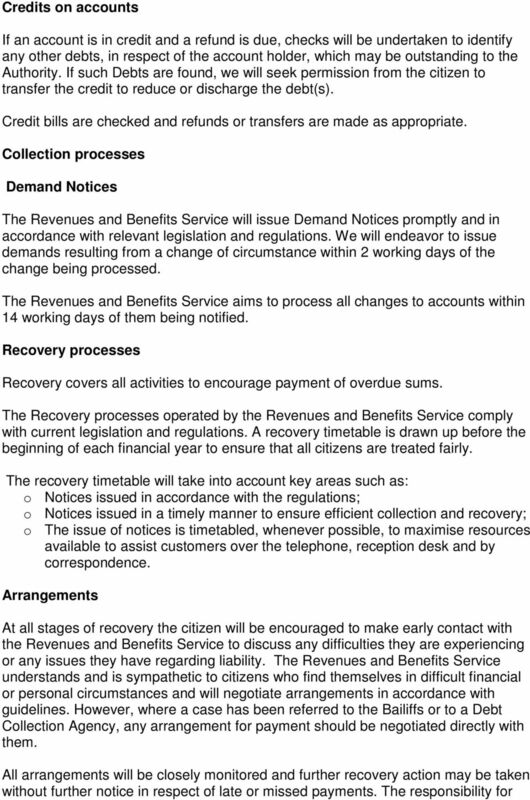 There will be significant costs associated with this method of recovery incurred by the citizen. 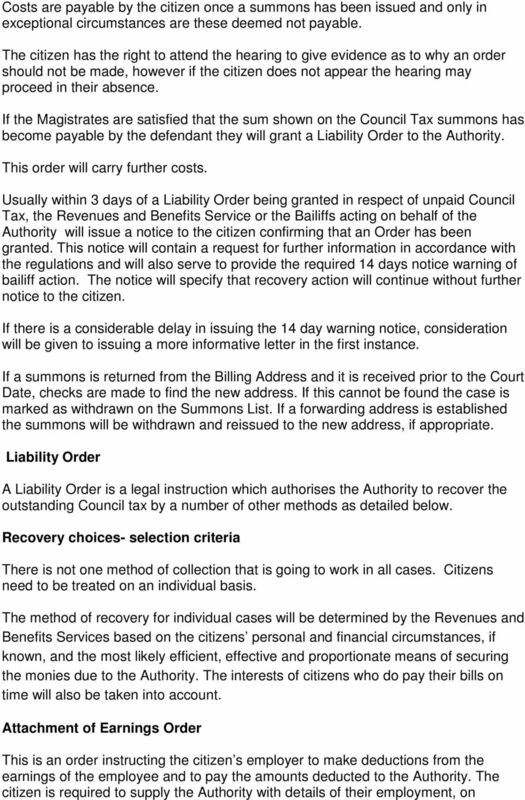 The citizen will be made fully aware of the serious consequences and the high level of costs likely to be incurred in a clearly worded standard letter which will be sent if it is decided to proceed with this method of recovery, prior to the service of the statutory demand. The consequences bankruptcy can impose upon a citizen are severe. Any bankrupt owning their own home is likely to lose it. It can be reasonably expected that the costs they will incur, in addition to any debt, will run into thousands of pounds if a trustee will be needed to distribute a bankrupt s estate. If it is decided that bankruptcy is the most proportionate and appropriate method of recovery, a statutory demand must be served. This will detail the debt the Authority is seeking to recover. 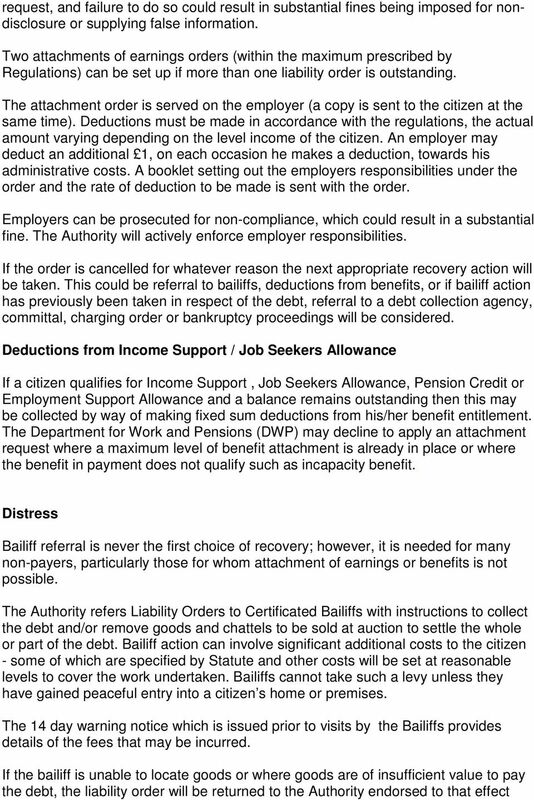 11 If a statutory demand is served and the debt remains unpaid after a further 21 days (or no satisfactory arrangement has been agreed), then a bankruptcy petition can be served (all these actions will be carried out by an insolvency practitioner on behalf of the Authority).Permission to proceed at petition stage must first be sought from the Business Manager, the Legal Services Manager or the Head of Revenues, Benefits & Welfare Rights. Where a bankruptcy order is made, and a citizen has assets that might be sold to settle a debt, a licensed insolvency practitioner will be appointed as a trustee to safeguard and secure the assets of the citizen for the benefit of creditors generally. Charging Orders and Enforced Orders for Sale Another method of collection available to an Authority is to seek a charging order against a citizen. 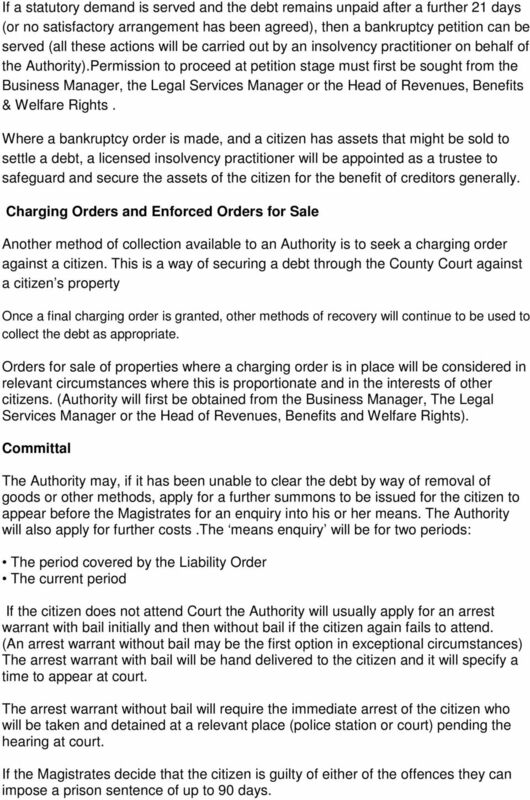 This is a way of securing a debt through the County Court against a citizen s property Once a final charging order is granted, other methods of recovery will continue to be used to collect the debt as appropriate. Orders for sale of properties where a charging order is in place will be considered in relevant circumstances where this is proportionate and in the interests of other citizens. (Authority will first be obtained from the Business Manager, The Legal Services Manager or the Head of Revenues, Benefits and Welfare Rights). Committal The Authority may, if it has been unable to clear the debt by way of removal of goods or other methods, apply for a further summons to be issued for the citizen to appear before the Magistrates for an enquiry into his or her means. The Authority will also apply for further costs.the means enquiry will be for two periods: The period covered by the Liability Order The current period If the citizen does not attend Court the Authority will usually apply for an arrest warrant with bail initially and then without bail if the citizen again fails to attend. (An arrest warrant without bail may be the first option in exceptional circumstances) The arrest warrant with bail will be hand delivered to the citizen and it will specify a time to appear at court. The arrest warrant without bail will require the immediate arrest of the citizen who will be taken and detained at a relevant place (police station or court) pending the hearing at court. If the Magistrates decide that the citizen is guilty of either of the offences they can impose a prison sentence of up to 90 days. 13 The creditors of these debts cannot take any action against the citizen after the order has been granted. A debt relief order normally lasts for twelve months after which time all of the debts included on the order will be written off. 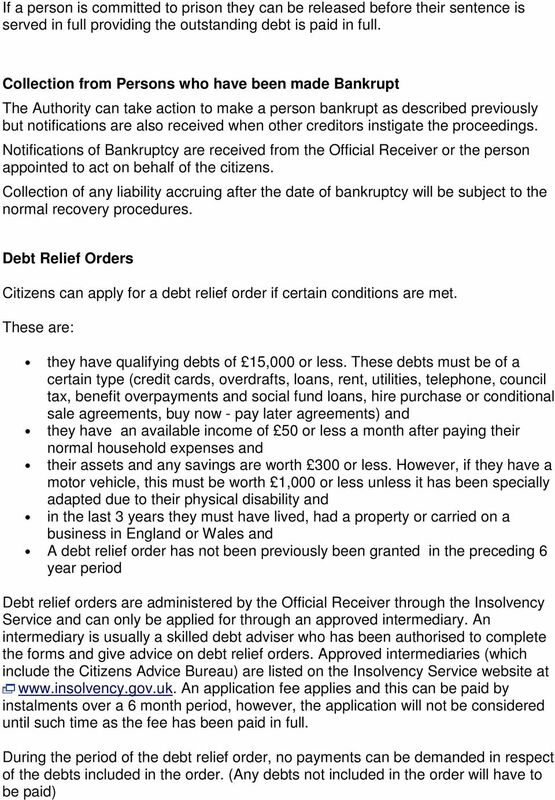 When a Debt Relief Order is received it will be checked to ensure that the full Council Tax debt due at the time the order was made has been included. If the Council Tax debt is greater than the amount specified in the order the Insolvency Service must be advised as this could increase the overall debt to an amount in excess of the qualifying amount of 15,000. Collection from Estates of Deceased Persons There will be instances where an account remains unpaid because of the death of a citizen. Reminders and summonses are checked for cases where the citizen is deceased. Reminders will be issued to the Executors of the Estate. 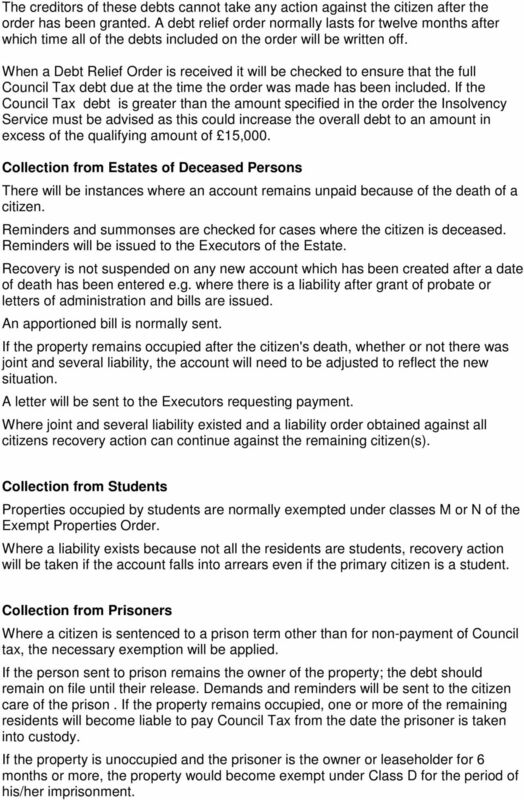 Recovery is not suspended on any new account which has been created after a date of death has been entered e.g. where there is a liability after grant of probate or letters of administration and bills are issued. An apportioned bill is normally sent. If the property remains occupied after the citizen's death, whether or not there was joint and several liability, the account will need to be adjusted to reflect the new situation. A letter will be sent to the Executors requesting payment. Where joint and several liability existed and a liability order obtained against all citizens recovery action can continue against the remaining citizen(s). Collection from Students Properties occupied by students are normally exempted under classes M or N of the Exempt Properties Order. Where a liability exists because not all the residents are students, recovery action will be taken if the account falls into arrears even if the primary citizen is a student. Collection from Prisoners Where a citizen is sentenced to a prison term other than for non-payment of Council tax, the necessary exemption will be applied. If the person sent to prison remains the owner of the property; the debt should remain on file until their release. Demands and reminders will be sent to the citizen care of the prison. If the property remains occupied, one or more of the remaining residents will become liable to pay Council Tax from the date the prisoner is taken into custody. If the property is unoccupied and the prisoner is the owner or leaseholder for 6 months or more, the property would become exempt under Class D for the period of his/her imprisonment. 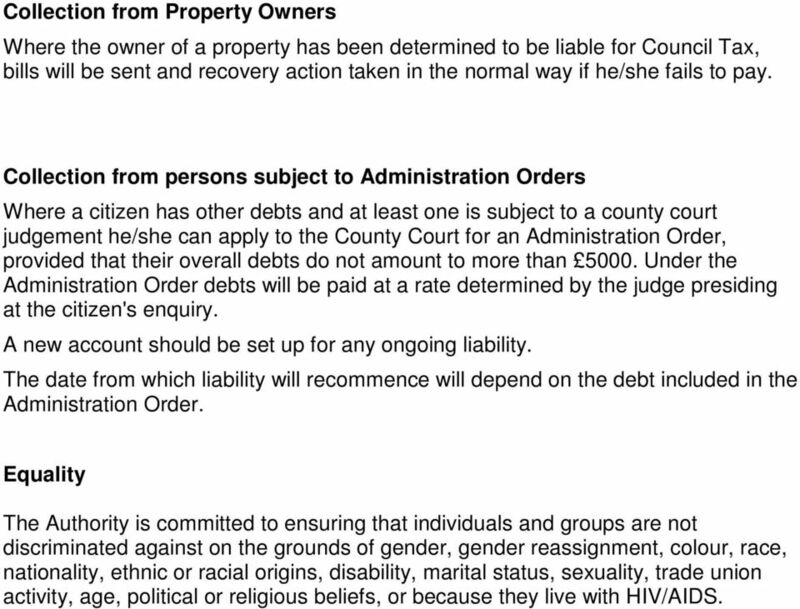 14 Collection from Property Owners Where the owner of a property has been determined to be liable for Council Tax, bills will be sent and recovery action taken in the normal way if he/she fails to pay. Collection from persons subject to Administration Orders Where a citizen has other debts and at least one is subject to a county court judgement he/she can apply to the County Court for an Administration Order, provided that their overall debts do not amount to more than Under the Administration Order debts will be paid at a rate determined by the judge presiding at the citizen's enquiry. A new account should be set up for any ongoing liability. The date from which liability will recommence will depend on the debt included in the Administration Order. Equality The Authority is committed to ensuring that individuals and groups are not discriminated against on the grounds of gender, gender reassignment, colour, race, nationality, ethnic or racial origins, disability, marital status, sexuality, trade union activity, age, political or religious beliefs, or because they live with HIV/AIDS.